What's New for the 2018 Honda Civic? The 2018 Honda Civic sedan typifies what a compact sedan strives for by successfully combining fuel savings with capable interior space and safety features. In fact, with its economical yet muscular engine selection, flexible cabin and trunk spaces, and high safety standards, the Civic enters 2018 with little need for big adjustments. 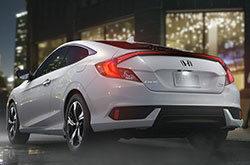 A look at the following qualities should reveal why the Civic is ready for the new year. Even the base Civic LX model offers considerable opulence, but there's also the EX, EX-T, EX-L, and Touring editions for incremental steps up the luxury ladder. All 2018 Civic sedans rely on the same basic body with 39.3 inches of front headroom and 42.3 inches of front legroom in the LX model that reduces to 37.5 inches of headroom up front and 36.8 inches in back with other versions possessing a moonroof. 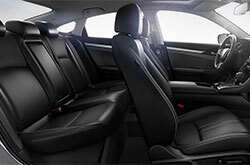 All editions give back passengers 37.4 inches for their legs and 15.1 cubic feet for their luggage. The LX comes equipped with power locks and windows, a 4-speaker 160-watt music system with a 1-amp USB interface port, a 5-inch control screen, and automatic climate control. The EX pushes the music system to 180 watts with 8 speakers, slides the USB port to the center console, expands the touchscreen to 7 inches, and includes a 1.5-amp smartphone USB connection along with Apple CarPlay and Android Auto. Unlike the LX and EX, the EX-T relies on the 1.5 liter turbocharged block to energize things while maintaining all the features of its EX cousin such as a 12-volt front outlet. Taking the advantages of the EX-T, the EX-L improves on them with a dual-climate control system and an auto-dimming rearview mirror. 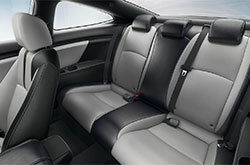 Top luxury is found in the Touring edition offering a 450-watt sound system with 10 speakers and a subwoofer. Compact sedans don't have a big demand for horsepower but Honda made sure all 2018 Civic engine choices possessed the strength for those sudden jolts required to glide through traffic. Even the introductory 2 liter inline-4 creates 158 horsepower and 138 lb-ft of torque. Coupled with a 6-speed manual transmission, drivers can look forward to 28 mpg city and 40 mpg highway*. With a CVT or continuously variable transmission, this bumps up to 31 mpg city and 40 mpg highway*. Turbocharging helps the 1.5 liter L-4 block move ahead in all categories. Horsepower increases to 174 while torque goes to 167 lb-ft. Working with the 6-speed manual transmission takes mileage to 31 mpg city and 42 mpg highway*. Swapping in the CVT results in top mileage of 32 mpg city and 42 mpg highway*. It's a good thing that there's always room for better safety technology. Otherwise, with 5-star grades across the board from the National Highway Transportation Safety Administration*, there would be nothing left for the Civic's designers and engineers to do. In concert with a rugged frame, antilock brakes, airbags, traction and stability control, and a rearview camera with multiple viewing angles help make every 2018 Honda Civic sedan exceptionally safe. There's also Honda Sensing. This package includes such things as forward collision detection with mitigated braking and a lane departure alert with steering correction to keep the vehicle on the road. This package comes as an option on all models except the Touring edition where it's standard. Come to Vandergriff Honda today to take a test drive and find out why this car is right for you. *Government 5-Star Safety Ratings are part of the National Highway Traffic Safety Administration's (NHTSA's) New Car Assessment Program. For additional information on the 5-Star Safety Ratings program, please visit www.safercar.gov. *Get Today's Price is available to all customers and can also be obtained by calling or coming into the dealership today. Purchase prices do not include tax, title, license and $150.00 doc fee. Prices include the listed offers and incentives. Please verify all information. We are not responsible for typographical, technical, or misprint errors. Inventory is subject to prior sale. Contact us via phone or email for more details. *MPG Based on 2018 EPA mileage ratings. Use for comparison purposes only. 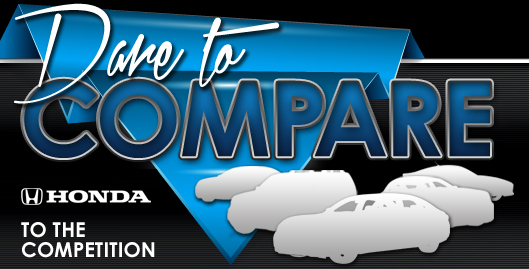 Your mileage will vary depending on driving conditions, how you drive and maintain your vehicle, battery-pack age/condition, and other factors.